then back to my face. Could it have been clearer? I took a step in the right direction. and I began to value you. Horses from prehistory to today, our ecstatic and tangled relationship with them, and their profound effect on world history, in 101 poems. Our lives have been intertwined for ten thousand years. History is horse stories . 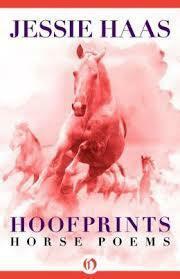 . .
Hoofprints ends with a brief prose history of horses, and a glossary. More detailed horse history may be found in Horse Crazy!, and in Storey's Horselover's Encyclopedia, due out in 2016. And the wings are lifted. And pranced beneath the hot Etruscan sun. Are really just a slight exaggeration. 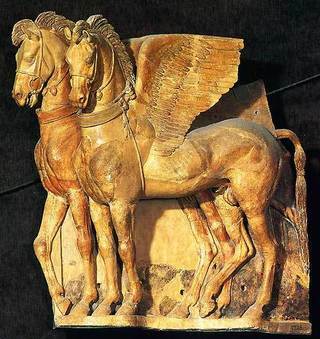 Etruscan winged horses from Museo Etrusco, Tarquinia, Italy, as they appear on the back cover of the Greenwillow edition of Hoofprints. My sister, Martha Haas, laid out this piece in April 2014, in support of the hardworking carriage horses of New York. We grew up in a Teamster household, on a farm, and we support horses' right to work. We also know what may happen to them if they don't work. Mayor DeBlasio needs to understand--if you ban them, most will die, and not in a green pasture somewhere, but in a Canadian slaughterhouse. As the signs on the highways say, Let 'em work, let 'em live. is accountable for each step taken. for less than three minutes. Ideally, she doesn't get killed. ahead of all the others. and then at last the whistle blows. the judge did not see that.